TACOMA, WA. (June 22, 2007) — Former world champions and current top-rated contenders VERNON FORREST and CARLOS BALDOMIR collide for the World Boxing Council interim super welterweight title, Saturday, July 28. Promoted by Gary Shaw Productions, in association with Brian Halquist Productions, the Forrest-Baldomir title tilt will be broadcast live from the Emerald Queen Casino in Tacoma, Washington, on HBO Boxing After Dark, beginning at 10:15 P.M. ET/PT (delayed on the west coast. Brian Halquist Productions has promoted the popular Battle at the Boat Boxing Series at the Emerald Queen Casino for the past 10 years. “We are so excited to be teaming up with Gary Shaw and HBO to promote this fight,” said Brian Halquist. “This is one of, if not the biggest fight in Washington State boxing history and it’s always been our goal to continue to promote bigger and better fights.” Halquist has promoted heavyweight contender Joe Hipp, four-time world champion Greg Haugen and contender Kenny Ellis. He also currently promotes Contender TV star Walter Wright (14-3) and upcoming superstars Roger Cantrell (11-0) and David Torres (18-0). It took 13 years from his pro debut for Baldomir (43-10-6, 13 KOs), from Argentina, to become an overnight sensation, but become one he did when he defeated undisputed welterweight champion Zab Judah via a 12-round unanimous decision, January 7, 2006, on Judah’s home court — Madison Square Garden. 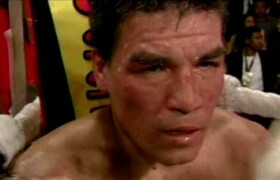 Baldomir’s victory was awarded “Upset of the Year” by The Ring magazine. After toiling in the trenches for 56 bouts and riding a 19-bout winning streak, Baldomir trained like a demon knowing this may not just be his best chance but his only chance at a world title. And it paid off. He beat Judah to the punch down the stretch, sweeping the championship rounds on all three judges’ scorecards, winning on scores of 115-13, 115-112 and 114-113. Six months later, Baldomir once again entered the lion’s den, defending his new title against two-time world champion Arturo Gatti, July 22, 2006 in Atlantic City — Gatti’s second home. This time Baldomir didn’t wait until the championship rounds to kick it into gear. Leading on all thee judges’ scorecards, Baldomir scored a TKO at 2:50 of round nine to retain his title. Baldomir’s title reign ended on November 4, 2006, via a 12-round decision loss to pound-for-pound kingpin Floyd Mayweather, Jr. Baldomir is currently world-rated No. 1 by the WBC. Forrest (38-2, 28 KOs), from Atlanta, took a different route from Baldomir in claiming his first world title. A classic boxer-puncher with an outstanding amateur pedigree, Forrest captured the vacant International Boxing Federation welterweight title, winning a dominant unanimous decision over Raul Frank, May 12, 2001. Forrest then took the biggest step of his professional career, risking his undefeated record in challenging WBC welterweight champion Sugar Shane Mosley, then considered boxing’s No. 1 pound-for-pound fighter, on January 26, 2002. Forrest beat Mosley from pillar to post for 12 brutal rounds, winning the title on scores of 118-108. 117-108, and 115-110. Though slightly closer in score, the result remained the same in the rematch, with Forrest prevailing again via a 12-round unanimous decision seven months later, July 20, 2002. Since losing his title to WBA champion Ricardo Mayorga in a 2003 title unification fight and unsuccessfully reclaiming it in the immediate rematch, Forrest has fashioned a three-bout winning streak, knocking out Sergio Rios and Elco Garcia and winning a 10-round unanimous decision over former world champion Ike Quartey. Forrest is currently world-rated No. 2 by the WBC. Next post: “The Hitman” KO’s Castillo With Body Shot In Round Four!